A Madeleine Peyroux performance — in what may be its steadiest, most accessible Trio form — is like overhearing a conversation by three people you’re rather fond of. At times the tone is genial, wry, or whispered with the occasional sigh. There’s laughter, too — but nothing raucous. You don’t want to miss a note or word, yet you take it all in while silently uncorking a 2009 Ledson Bellisimo. Landmark hosts a dramatic range of acts, from the roof-raising Smithereens to the confetti-dropping They Must Be Giants. Some are memorable for tonal range, as with Annie Haslam of Renaissance, others through inspired effects, as when Gerry Leonard carried Suzanne Vega’s lyrics aloft. But on this fall evening, made darker by murderous events in Paris the night before, Madeleine Peyroux brought the sellout crowd a blend to be steadily sipped. No dramatic triple fortes, no heart-racing crescendos, hand-clapping and drum solos to impress the likes of Neil Peart. Focused and dressed in winter darks, Peyroux began with “Take These Chains,” simply asking to be set free from love, but the headlines had made it harder still to “take these chains from my heart.” Still the trio would find a way, its other two edges filled out by one Jon Herington @heringtonband on hollow body electric (at times in “Take These Chains” imitating a steel guitar sound) and Barak Mori on standup bass. Without moving from that seat, she’ll take you “Between the Bars” (Elliott Smith), urging you to “Tango Till They’re Sore” (Tom Waits). For me to pretend that I’m someone else. Someone who had not learned of Friday night’s events. The trio is fully warmed up when it gets to the century-old standard “Weary Blues” (Artie Matthews). Not at all weary, both Herington and Mori ripped off two breaks each that showed they were “all in,” and ready for the witty Allen Toussaint tribute “Everything is Gonh be Funky (From Now on)”. Sometimes musicianship took center stage. Herington’s fills in “Got You on My Mind” were so reminiscent of Les Paul that they eclipsed the song’s intended subject. The bossa nova classic “Água de Beber” was a perfect evening breeze yet to be captured in any studio version. There was more: “Keep Me in Your Heart” (Warren Zevon, arranged by Herington) and her hit,“Careless Love” performed as an encore, complete with a Bucky Pizzarelli-style play-and-sing solo by Herington. Which would have been amazing had not Mori done it even more memorably on bass. The productive Toussaint, Rock and Roll Hall of Famer, producer of the Dr. John classic “Right Place” and Al Hirt’s classic “Java” had died suddenly the week before. Nor would it be Peyroux’s last New Orleans reference, as the trio later covered the “New Orleans Hop Scop Blues” (George W. Thomas). As for the prancin’, dancin’ and dyin’, though the night before had shown “white folks do it too,” Peyroux, who lived for a time in France and is of French descent was no ambassador for America’s first ally. She was but the sommelier of an evening. Such an evening, but there was no more Ledson to be had. We had allowed her to dance us clear to the end of love, yet she was not to mention the events of the night before, except to have us “Lift [her] like an olive branch” in that jeweled version of Cohen’s micro-treatise. On this evening, nihilism had no song to sing. Whether through instinct or love, the pairing of opening act Rebecca Pronsky’s songwriting and the silken guitar work of Rich Bennett is a lucky convergence. Think Patty Larkin song craft wedded to guitar sounds associated with the Chris Isaac classic, “Wicked Game,” and, yes, Pronsky admits her game is a little dark, if not wicked. Her lyrics in “Hard Times,” “Fragile World” (about childhood friends’ exodus from Brooklyn, to be found on her album Viewfinder), “Aberdeen,” the singalong “Big City Lights,” and — best — “Shadow” (inspired by the Dark Universe show at the Hayden Planetarium), were nevertheless appreciated in a single hearing by an audience that likely did not know of her. The “shadow holds me in,” she sang, while Bennett’s hollow body Gibson with delay and reverb lingered lovingly over sobering chord changes that matched the song’s mood. (Advice to young guitarists: shred doesn’t always carry the day). The shadow held us in. 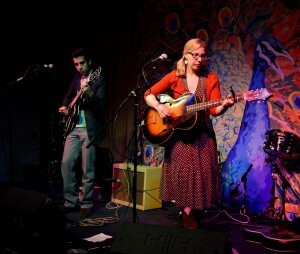 Brooklyn native Pronsky is young, but already has an easy stage presence, which she exploited to ruminate about idol Joni Mitchell, the latest on Amelia Earhart archaeology, and what she was about to learn from Madeleine Peyroux. She is already wise beyond her chords. Peyroux has in the past worked with Nellie McKay (Landmark performance reviewed in 2013). 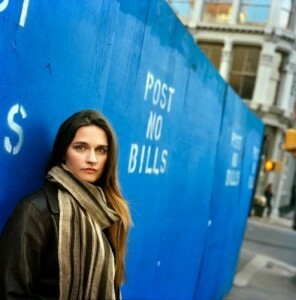 Madeleine Peyroux (Mary Ellen Mark), Rebecca Pronsky (Meg Hamilton), event photo (Rebecca Pronsky), other photos via the artists.